Read to the Dogs, MAR. 2 and Wednesdays, 1 – 2 p.m., at East Mountain Library in Tijeras. Children of all ages to practice reading out loud to therapy dogs. No registration required. For info, 505-281-8508. 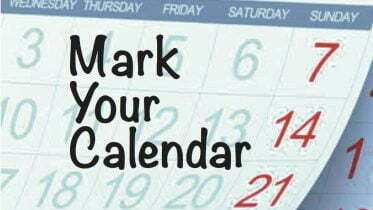 East Mountain Chamber of Commerce lunch meeting, 11:30 a.m. MAR. 3 at Los Vecinos Community Center in Tijeras. RSVP to info@eastmountainchamber.com or 505-281-1999. VFW Post 3370 Steak and Fish Night, MAR. 5 and first Saturdays, 4 – 9 p.m. For info, 505-832-0730. 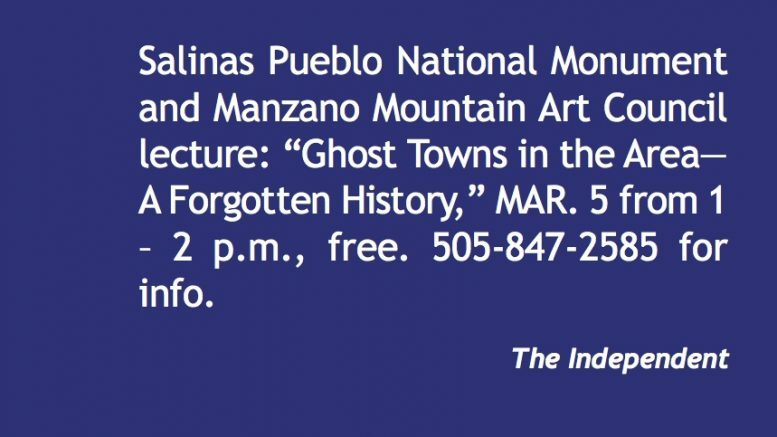 Salinas Pueblo National Monument and Manzano Mountain Art Council lecture: “Ghost Towns in the Area—A Forgotten History,” MAR. 5 from 1 – 2 p.m., free. 505-847-2585 for info. Watermelon Gallery in Cedar Crest, reception for Michael Meyer and John Eisler, 4 – 8 p.m. MAR. 4. For info 505-286-2164. Town of Edgewood Parks & Rec advisory committee, meets MAR. 7 from 6:30 – 8:30 p.m. at the Edgewood Community Center. For info, 505-286-4518. Friends of Tijeras Pueblo lecture on early village organization in the Tularosa Basin, by David H. Greenwald, MAR. 8 at 6:30 p.m. at the Sandia Ranger Station in Tijeras. $5 donation for non-members. Info, 505-281-3304.
Business Mixer at Mags Indoor Shooting Range, MAR. 9 from 4 – 7 p.m. For information call 505-338-2222. Prayer Encounter, MAR. 11 at 7 p.m. and MAR. 12 from 8:30 – 2:30 p.m. $20 includes materials and lunch. At Mountainside United Methodist Church, Cedar Crest. For info, 505-281-5117. Jimbo’s live music MAR. 13 and second Sundays, 3 – 6 p.m. at Lazy Lizard in Cedar Crest. For info call 505-281-2313. Women’s Shooting Connection of NM event MAR. 13 at Mags Indoor Shooting Range in Moriarty. Trish Hoffmapn of APD on how not to be a victim. For info 505-250-4175. Benefits counselor from NM Aging and Long-Term Services Dept. will be at Tijeras Senior Center MAR. 14 from 10 – 11:30 a.m. Call 286-4220 for info. Moriarty High School’s Mad Horse Productions presents King Arthur’s Socks, MAR. 17, 18 and 19 at the Performing Arts Center. Tickets $3 at the door. Q&A with cast and crew after the play. American Legion Post 74 and Auxiliary, meets MAR. 18 or third Fridays at the Lions Club in Moriarty. For info, 505-803-9657 or sunsetministries@yahoo.com. Seed Saving Workshop at Edgewood Soil and Water Conservation District, from 10:30 a.m. to noon. APR. 2. Email info@eastmountainseed.org.